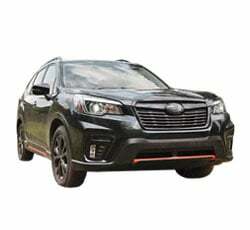 Brand new for the model year is the 2019 Subaru Forester. Having been redesigned to kick off the fifth generation of Foresters, there are a lot of changes to be found on the new line-up. Still, drivers can expect a lot of the same things they have loved about previous model years, such as the standard all-wheel drive, plentiful cargo space, and an impressive amount of ground clearance that makes off-roading feel exciting. Many changes have been made to the 2019 Subaru Forester since it is just entering its fifth generation. First and foremost, there is a new 2.5-L 4-cylinder engine that is more powerful than the previous base engine. Also, the 2.0-L turbocharged engine is no longer available. Subaru's EyeSight system (a bundle of advanced driver aids) is now standard across the line-up. Finally, Subaru has increased the amount of cargo and cabin space in the new Forester, making it even easier to tote people and bulky items. This year, Subaru added some additional cargo space to the 2019 Subaru Forester. It added 1.4 cubic feet of cargo space to allow for a total of 76.1 cubic feet with the rear seats folded down. This number bests quite a few of the Forester's top competitors, including the Honda CR-V. Additionally, the maximum rear cargo area's opening is wider than the 2018 model by 5.3 inches, which allows for easier loading. There is more cabin space to be found on this year's Forester. The rear seat alone gets an additional 1.4 inches, bringing it to 39.4 feet. This gives long-legged adults plenty of space to stretch out their legs while riding in the back. Up front, the cabin feels even more spacious with more than enough head room to spare. As per usual with Subaru, all-wheel drive comes standard on every 2019 Subaru Forester trim level. Most of Subaru's competitors do not offer all-wheel drive as a standard feature across their line-up and make drivers pay extra to upgrade to AWD if it is even available. Subaru's all-wheel drive system gives the vehicle extra grip and stability while driving off-road or during those harsh winter months when slide-offs and spin-outs are all too common. On the previous Forester models, Subaru EyeSight was more of an optional feature. This year, Subaru has made it standard on every trim level. This suite of advanced driver aids includes helpful features such as lane departure warning with sway warning, pre-collision throttle management, lane keep assist, and adaptive cruise control. Other optional features include blind-spot monitoring with rear cross-traffic control and lane change assist as well as reverse automatic braking. All of these features are easy to use and are not intrusive while driving. Overall, the 2019 Subaru Forester looks more upscale than previous model years. Both the 6.5 and 8.5-inch infotainment touchscreen displays are clear and easy to read, positioned smack-dab in the center console for all to see. There are a lot of soft plastics throughout the cabin that manage to look and feel nice. The line-topping Touring trim adds a chic faux leather that gives the impression of riding in class. For the first time, smartphone app integration via Android Auto and Apple CarPlay now comes standard on every Forester trim level. These features make it so that drivers can access the apps that they love on their Android or Apple smartphones and sync them to their vehicle. The smartphone app integration system is easy to use and can be accessed through the well-designed new touchscreen display on the center console. The 2019 Subaru Forester now includes young driver features available through Starlink connected services. This system will alert young drivers when they are going too far above the speed limit. It also has geofencing, which utilizes GPS to design a virtual geographic boundary which issues an alert when the connected device strays outside of that area. This gives parents the peace of mind in knowing that their new driver is staying safe on the road. In addition to making the interior look more sophisticated, the Forester's seats are far more comfortable than ever before. Up front, there is a wide range of adjustment for the seats, and the front head rests have an adjustable tilting mechanism that add extra comfort. In the rear, the seats are slightly higher up but won't provide a problem for most adults. All of the seats feel well-bolstered, and the front seats provide more than enough lumbar support. DriverFocus is a brand-new safety system that is making its debut this year on the Touring trim. This system utilizes near-infrared cameras inside of the vehicle to monitor the driver's facial recognition for their head's position. If the system finds that the driver seems sleepy or distracted, it will issue a warning to help keep the driver from losing focus on the roadway. The Forester now comes with an impressive 8.7 inches of ground clearance, which makes this vehicle a capable off-roader since it is paired with a strong all-wheel drive system. The Forester glides easily over bumpy surfaces, and there is less reason to worry about bottoming out while taking the Forester off of the beaten path. Producing just 182 hp and 176 lb-ft of torque, the 2.5-L 4-cylinder engine that comes standard across the line-up just does not produce enough power to get this vehicle up and running as quickly as many of its competitors. Acceleration feels pretty lackluster, so trying to get this vehicle up to highway speeds might be more of a chore than a driver would bargain for. With a maximum tow rating of 1,499 pounds, the 2019 Subaru Forester falls short of its competition. Many of the Subaru's competitors can manage to get somewhere between 2,000 and 3,000 pounds, so drivers who plan on doing a lot of towing might end up considering other options and overlooking the good things that the Forester has to offer. It is a bit baffling as to why Subaru has not yet swapped in a regular automatic transmission for the old CVT. The CVT is the only transmission option available since there is no manual transmission option (something which might appeal even more to those who like to go off-roading). The CVT just feels lackluster since it is paired with the under-powered 2.5-L engine. With the old turbocharged engine's extra bolt of energy gone from the powertrain options, there is little to get excited over in terms of a powerful performance. One of the things Subaru struggles with on some of its vehicles is handling. While steering usually feels responsive enough, the Subaru Forester does not have the same finesse you will find on many of its competitors. Handling has been improved over the 2018 model, but it lacks the precision other vehicles in its class possess. The 2019 Subaru Forester manages to best the 2019 Honda CR-V for cargo space this model year since the CR-V offers 75.8 cubic feet with all seats folded down. Unfortunately, the trade-off here is that the CR-V offers more leg room in the rear than the Forester. The CR-V lacks some of the seat comfort you get up front in the Forester, but it provides the driver with a massive amount of outward visibility all around the vehicle. The 2019 Toyota RAV4 is stiff competition for the 2019 Subaru Forester with its off-roading capabilities and availability of a hybrid model that produces excellent fuel efficiency. However, the RAV4 has some bizarre drawbacks, including the availability of Apple CarPlay (finally) but not Android Auto. Also, the RAV4 has some nice styling upgrades for the model year, but some drivers might find the beefier grille to be a tad obnoxious-looking. The more subdued external appearance of the Forester might seem more appropriate for a daily driver. The 2019 Subaru Forester has a few drawbacks (especially when it comes to the engine and CVT pairing), but there are many new and wonderful things to enjoy about this vehicle. The standardization of so many infotainment and safety features is a huge draw for families and young drivers, and the off-roading capabilities are some of the better ones that can be found in this class. Expect to find a lot of comfort throughout this well-designed cabin and utility in the cargo area.